CORONA, NY — The Louis Armstrong House Museum, the National Historic Landmark dedicated to the cultural, historical and humanitarian legacy of Louis Armstrong, today announced Kenyon Victor Adams as the new director of the organization. Adams will succeed founding Director Michael Cogswell. Adams comes to the Museum from Grace Farms Foundation, the New Canaan, CT based non-profit that owns and operates Grace Farms and the SANAA-designed River building, where he has served as the Founding Director of the Foundation’s Arts Initiative since 2015. Adams’ timely appointment arrives on the heels of the massive digitization of the Museum’s Research Collections, made possible through a gift from innovative entrepreneur and philanthropist, Robert F. Smith’s Fund II Foundation. Currently under construction across the street from the Museum is a new 14,000 square foot cultural center on a lot purchased for the Museum by the Louis Armstrong Educational Foundation. The $23 million facility–to be completed in 2020 –funded by a variety of benefactors including the NYC Department of Cultural Affairs, Queens College, the Borough President of Queens, The Office of the Mayor, the NYC City Council along with major support from the Governor and the NYS Senate and Assembly – will house a state-of-the-art exhibition gallery, an interdisciplinary performance and convening space, museum store and the Louis Armstrong Research Collections, currently housed at Queens College. The Museum has also received funding from the City to renovate the historic house next door to the Museum, former home of Armstrong’s family friend and neighbor, Selma Heraldo—known as Selma’s House. 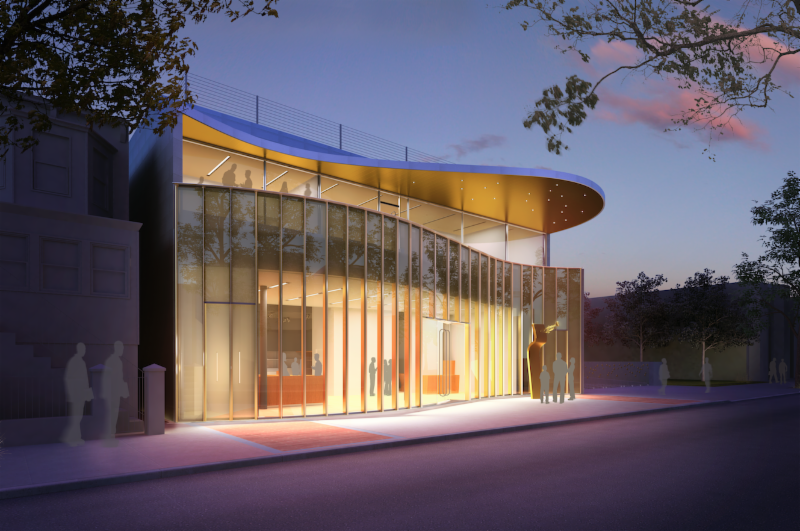 The new cultural center along with the Historic House Museum and Selma’s House, comprise a multi-faceted campus in the Corona neighborhood of Queens, highlighting the relevance of Armstrong’s contributions as artist and innovator, and introducing new programming for all audiences. Adams brings an interdisciplinary, multi-sector approach to his role at the Louis Armstrong House Museum, celebrating Armstrong as one of the greatest innovators of the 20th Century and examining the extraordinary reach of the artist’s contributions through the lens of various disciplines. “Kenyon Victor Adams will be a welcome addition to the Louis Armstrong House Museum. He will surely help further the Museum’s mission of promoting and preserving the cultural, historical, and humanitarian legacy of Louis Armstrong, and I look forward to the Center and the Queens community benefiting from his leadership,” said Queens College President Félix V. Matos Rodríguez. At Grace Farms, Adams established the Arts Initiative, which develops new, collaborative, and site-specific works at the intersection of the visual, literary, and performing arts. Through a process-based, inquiry-driven workshop approach, the Arts Initiative under Adams’ leadership welcomed hundreds of artists for the development and support of new works, including Meredith Monk, Ron McCurdy, Matthew Rushing, Samora Pinderhughes, Andrea Miller, Kevin Young, Nicole Sealey, Bill T. Jones, Julianne Swartz, Camille A. Brown, and Ilya Kaminsky, as well as produced a robust array of public programs for all ages. As an artist, Adams’ recent performance work, Prayers of the People, Directed by Bill T. Jones and currently in production, premiered last April as part of the Live Ideas festival at New York Live Arts. He studied religion & literature at Yale Divinity School, and theology of contemporary performance at the Yale Institute of Sacred Music, where his presentation of blues aesthetics as American lament earned him the Institute’s Director’s Prize. He has contributed art and thought leadership at the Yale School of Drama, the Langston Hughes Project, the Yale ISM Poetry Conference, the National Arts Policy Roundtable, and the Hannah Arendt Center at Bard College. Mr. Adams served as Artist in Residence at Yale Institute of Sacred Music for the 2015-16 academic year and has worked closely with Willie Ruff, the founding Director of the Duke Ellington Fellowship Program at the university. The Louis Armstrong House Museum sustains and promotes the cultural, historical and humanitarian legacy of artist and innovator Louis Armstrong by preserving Armstrong’s home, providing access to the extensive archives, and developing programs for the public, which educate and inspire community members, curious visitors, artists of all kinds, fans, and future generations of Armstrong appreciators. What was once Louis and Lucille Armstrong’s private home—a New York City and National Historic Landmark—is now a historic house museum open year-round. The expansion of the Corona Armstrong campus with a new cultural center scheduled to be completed in 2020 and the renovation of the next-door home of the Armstrong’s lifelong friend Selma Heraldo, will allow the Research Collections to move from Queens College back to Corona. The expanded campus will become a new, international destination celebrating Armstrong’s preeminence in African-Diaspora history and vitality, offering year-round exhibitions, performances, readings, lectures, and screenings through an array of public programs for all ages. The Museum is a cultural center of the Kupferberg Center for the Arts at Queens College. For more information visit www.louisarmstronghouse.org.